What do we see, when we see the world? In today’s world transcended by digital technology and flooded with representations, models and mashups the question of ‘what are we looking at?’ becomes more important. The many layers of data and visualisations in many cases start clouding the subject or in some cases appears completely detached from it and develop a dynamic of their own. The kind of critiques are nothing new and have been heard through out the past decade. How perception is manipulated with information has been discussed for example in the book How to lie with Maps by H.J. de Blij , 1992. Here de Blij presents examples of representations and how they are used to favour certain aspects. Or also indeed The Power of Maps by Denis Wood, 1992, You are Here by Katharine Harmon, 2003 or the Atlas of Radical Cartography edited by Alexis Bhagat and Lize Mogel, 2008, to name a few of the recent cartography/mapping books of the recent years. In a new Zone Books publication Close up at a Distance: Mapping, Technology, and Politics Laura Kurgan presents her research work and offers a theoretical discussion on the usage and employment of representations. Whilst most of the presented works have been seen around the web in the past few years, the book offers a bunch of new perspectives by bringing the series of works together and wrapping them in a theoretical discussion. Laura Kurgan is Associate Professor of Architecture at the Graduate School of Architecture, Preservation, and Planning at Columbia University, where she is Director of the Spatial Information Design Lab and Director of Visual Studies. Whilst Lying with Maps focused heavily on the map and its technical aspect such as projection, Kurgan goes deeper and explores the fundamental relationship between the visual and a visualisation as much as the technicality of production. The projects presented n the book take the read far beyond the mere representation of physical geography. The author emphasises the power within the techniques of spatial representation and unmasks the promise of truth associated with such representations of abstract knowledge. 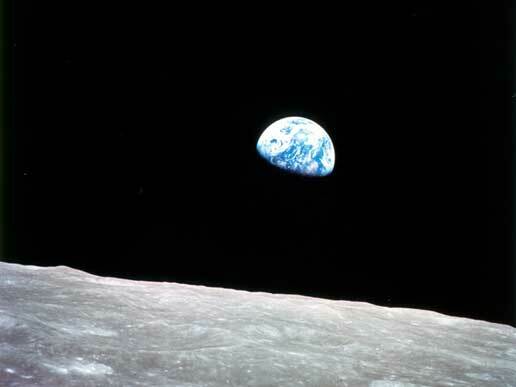 Image taken from the NASA / This photo of “Earthrise” over the lunar horizon was taken by the Apollo 8 crew in December 1968, showing Earth for the first time as it appears from deep space. The introduction to the book summarises this approach in a very nice way. Kurgan presents the series of ‘Blue Marble’ photographs released by NASA over the past 55 years and discussed the evolution from the initial ‘Earth Rise’ photograph actually taken by the astronaut on the Apollo 8 mission orbiting the moon to the 2012 version ‘Blue Marble: The Next Generation 2012’ assembled “from data collected by the Visible/Infrared Image Radiometer Suite (VIIRS) on the Suomi NNP satellite in six orbits over eight hours”. Image taken from spatialinformationdesignlab.org / Million Dollar Block by Laura Kurgan and Spacial Information Design Lab. Map shows Government spending on incarcerate of individuals per block. Bright red represents more than 1 million $ of spending a year. The example puts upfront the discussion and the shift from a photograph take from outer space, but still ‘as seen by the human eye’ through the lens of a camera to the ‘360-degree composite, made of data collected and assembled over time, wrapped around a wireframe sphere to produce views dynamically selectable and constantly updatable. The second part featuring projects developed over the past 20 or so years take the reader from basic and playful but very intellectual GPS experiments to ware zones in Bosnia, Iraq and Kuwait and to inner city migration facts. Its a tour de force with a lot of depth. Definitely a book for anyone interested in the representation of spatial data. Kurgan, L., 2013. Close up at a Distance: Mapping, Technology, and Politics, New York: Zone Books.